Summary: Turns out you can go too far in PPC cost optimization. Learn how to avoid the dreaded "limited" campaign status in Google Adwords. There is such a thing as over optimization in PPC. In your quest to lower costs you can actually go too far. This article shows the effects of driving down CPC and cost per conversion and a potential solution. We've had good success driving the cost per call down using maximum CPC with or without enhanced CPC. Past a certain point however, you may see the dreaded "limited" status (see Figure 1). In this case, the maximum bid (max CPC) is lower than many or all of the average keyword bids. At the least this will drive down your ad positions, at the worst your campaign will be "throttled" by Google. You can increase your daily budget to compensate, but at lower max CPC levels, this technique may not compensate enough. With max CPCs close to your average CPC, you can compensate with higher daily spend limits. Past a certain point, however, no matter how high you set your daily budget, you may not meet your monthly spending target. In our case we were spending about 60-65% of our monthly target budget with three limited campaigns. The solution, after an approriate number of conversions, is to switch to a smart bidding strategy. By using Target CPA at the recommended level by Google, we were able to keep costs down and avoid throttling the campaigns. More on Target CPA in a future tweak. Optimizing costs in PPC campaigns is an admirable goal. However, you can go too far in driving costs down. 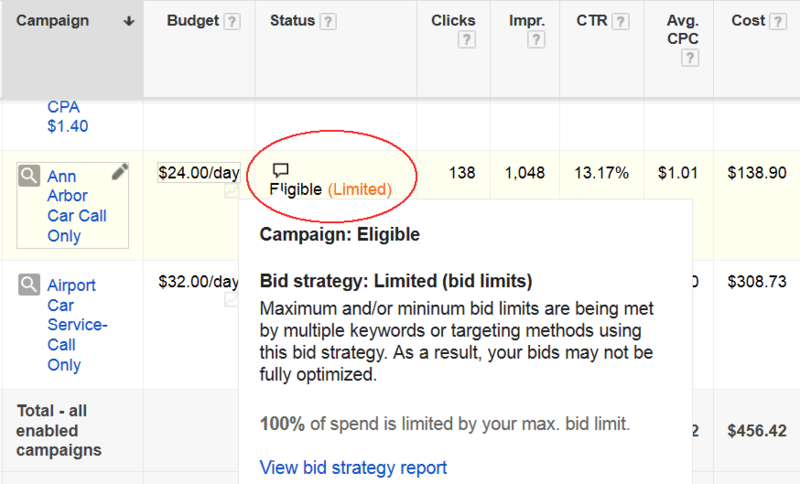 Learn how to avoid the dreaded "limited" campaign status in Google Adwords. Michigan Green Cars was the subject of this case study. Thanks again to Greg Tobias for permission to use his PPC campaign as an example. Learn how small changes in ad text can make big changes in performance. By varying our Ad Title text we improved ad position from 2.4 to 1.0. Last modified: October 01, 2018.